The concept of 3D printing is taking the world by storm. The potential applications are endless, with particularly promising advances in the medical and dental fields. It’s still a relatively new technology, but traditional dental laboratories could go the way of typewriters and film cameras if 3D printing continues forward at its current pace. Already worth $780 million in the dental market, 3D printing could become a $3.1 billion industry in this sector by 2020, according predictions in a report released in May 2015 by SmarTech. The prevalence of 3D printing in other markets is expected to grow as well, but better 3D printers and materials are already being manufactured specifically for dentists. SmarTech also predicts the sale of 3D printing systems to dental labs will double from $240 million today to $480 million by 2020. 3D printing technology is also expected to provide more than 60 percent of all dental production needs by 2025, and perhaps even more in certain areas such as dental modeling. Replace or repair a damaged tooth: The dentist scans the patient’s mouth with a small digital wand. This creates a 3D image of the teeth and gums, which is saved as a computer file. Computer Aided Design (CAD) software enables the dentist to digitally design the tooth repair and print the finished product on a 3D printer. 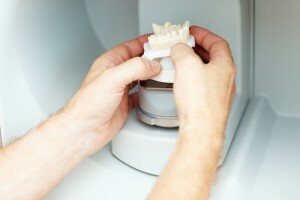 Create an orthodontic model: Pre-3D printer technology includes having the patient bite down on gooey, uncomfortable clay so it could harden into a mold, which becomes the initial model for designing a treatment for braces or Invisalign. This is not so with 3D printing. A dentist can use the same technology highlighted in the first example to scan the teeth, design an orthodontic appliance and print the end result in-house. Produce crowns, bridges, caps, dentures and more: The same process outlined above can be used to 3D print all kinds of dental implants. The only difference is the precise material used in the printing process. Construct surgical tools: Not only can 3D printers handle the dental implants themselves, but they can also 3D print the drill guides needed to complete certain dental procedures. Dentists save money: Adding on a dental laboratory is a significant cost for any dental practice. If implemented in-house, the initial cost alone could be $100,000. Then, employing skilled staff to produce dental implants presents a considerable ongoing investment. In all, depending on the volume of work, the cost of running a dental laboratory can reach $100,000 per year. Compare this to the one-time cost of about $20,000 for a top-model 3D printer, which includes a starting supply of materials. Ongoing materials factor into the lifetime cost, but it’s far, far lower than running a dental lab. Patients save money: The high costs of adding and running a dental laboratory is reflected in each patient’s bill. Using traditional technologies, a single crown can easily cost a patient $2,000 or more. When 3D printers lower overhead costs by 80 percent, dentists can pass the savings on to their patients. Dental and orthopedic services are faster and more accurate: Manual model-making is time consuming while 3D printing allows for multiple appliances to be printed at once. Accuracy is also improved since 3D printers convert digital images into physical objects by printing 16-micron-thick layers one on top of the other. Increased production capacity and more accurate end results benefit both dentists and patients. If you want the best possible dental treatment for you and your family, choose Evanson DDS in Parker. Contact us online or call us at (720) 409-0008 to schedule an appointment for you or a family member.